Many homeowners, after they come home from work, feel the need to retreat to a place that will provide them with a sense of comfort. A warm and cozy bedroom is just what many of us need in order to relax and forget about our troubles at work or school. Sleeping, meditating, or simply daydreaming – the bedroom is a place where we should be able to do all that. There are many ways to create a bedroom that is calming and chic and that will serve as an oasis you will long to return to. Read on to learn about six ways to do just that. Colours have a big impact on how we feel. When it comes to painting your bedroom walls, you need to choose colours that will have a calming effect on you since your bedroom is a place where you go to rest, where you sleep, read or meditate. You want to make sure it fills you with positive energy and gives off a peaceful, serene vibe. Opt for neutral colours like white, beige, and light blue, and decorate your bedroom by using a colour scheme of three to four colours that mix well – use the colour wheel to check which colours you can combine. After a long day of work, there’s nothing we would like more than going straight to our bed to relax. Getting a good night’s sleep is crucial for functioning properly during the day. That is why it is important to invest in a bed that is comfortable and cozy. There is a wide range of quality king beds you can choose from in order to find the one that suits both your needs and the style of your bedroom. You should also look for mattresses that support your back properly and consider replacing them every ten years to preserve your health and well-being. Having a clutter-free space is a crucial part of creating a chic and calming retreat. Go through your wardrobe, drawers, and nightstands – you’ll be surprised to see just how many things you don’t use or need, and how many of them don’t really belong there. Throw away, hand down or donate all the clothes and shoes you don’t use. Use the popular KonMari Method of decluttering – get all your things on a pile, go through them and keep only those things that spark joy. That way, you will free up your space while also mentally detaching yourself from things, thus bringing peace and balance into your bedroom. A calming fragrance in your bedroom will calm you down and help you fall asleep more easily. Consider purchasing an oil diffuser with your favorite fragrance – lavender or chamomile essential oils are always a good choice. Scented candles are a good alternative to essential oils – they have the same effect on your mind. Relax by lighting vanilla or rosemary scented candles in the evening. Opt for natural scented candles, like beeswax or soy wax candles – they are a safer option than paraffin wax candles and can be beneficial in many ways. Nothing freshens up your living space as plants do! Make your bedroom come to life with plants like the snake plant, spider plant and peace lily. Not only do plants and greenery add a chic and calming vibe to your cozy retreat but they also purify the air, absorbing the harmful pollutants and providing your room with oxygen. The best thing about these low-maintenance plants is that they don’t need special attention and only require low to medium exposure to sunlight and water from time to time. How your furniture is arranged can have an impact on the overall appeal of the room, as well as how you feel when you spend your time in it. According to Feng Shui, the placement of objects within a space determines the flow of energy. 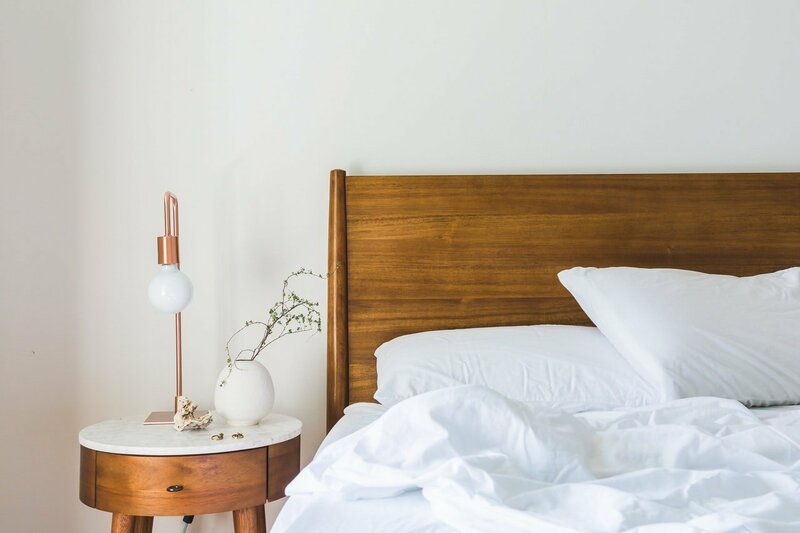 Therefore, by organizing your bedroom in accordance with Feng Shui, you will promote a harmonious flow of positive energy, thus bringing balance and harmony into your living area. Creating an area in our home that will be our own peaceful retreat is crucial for preserving our mental health and well-being. By following our tips, you will create a bedroom that will bring you joy and help you relax, serving as your own stress-free oasis. I know the KonMari Method is pretty trendy right now, but it’s so useful and really does help bring peace back to rooms! I grew up a packrat, but keeping only what brings me joy has been a great way to help me declutter.